I’m getting married again at the end of May. Since this is my second marriage, as well as the groom’s, we’ve opted for a informal wedding with close family and a few friends on the beach in South Carolina. Since my dress is light blue, I need a pair of sandals that will match. Can you please help? Manolo says, ayyy! So romantic! Indeed, just the words “beach wedding” alone can conjure up in the mind of the hearer all sorts of fantastically romantic scenarios to explain why someone is getting married at the seashore instead of the church or the justice of the peace. For the example, you are the beautiful mermaid of the certain age who, during the giant storm, has been washed ashore suffering from amnesia only to be found by the handsomely rugged sea captain (played by the Tom Selleck), who despite the long-standing and well-know animosity between seafarers and merpeople (in reality misunderstandings caused by practical joking dolphins) has carried you back to his skipjack and chastely restored to health, hand feeding you sardines and oysters and little pieces of delicious eel, while softly singing sea shanties and playing his ukulele. When your health and memory have returned, rather than swimming back to your underwater home, to your rightful place as Neptune’s spinster merdaughter, you have convinced the old merwizard to give you legs. Many complications and dangers ensue, but in the end, here you are, standing on the beach in South Carolina with the man in the Hawaiian shirt and famous mustache getting married. 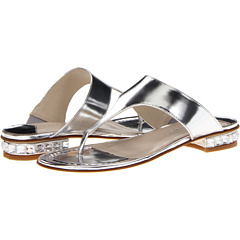 Here is the Connie from Donald J. Pliner, the silver thong sandal that will be perfect for wearing on the beach. This entry was posted on Tuesday, April 23rd, 2013 at 9:55 pm by Manolo the Shoeblogger and is filed under Donald J. Pliner, Shoes. You can follow any responses to this entry through the RSS 2.0 feed. Both comments and pings are currently closed. I love the Manolo stories! Manolo, you make my day whenever I read one and I have missed them recently! Sadly, the shoe shopping had to be curtailed, as I tended to buy all Manolo recommendations, and then tell your stories, giving full credit to you, as friends seem to think I am incapable of fanciful thoughts. But I still get a thrill when I read your column.